family frolics: our neighborhood museum. A block from where we live. The once-town hall, then prison, now museum of great artifacts rests only paces from our front door. When you walk by its doors you can glean a peek inside the statuesque piazza. Just by putting your forehead against the window and gazing, you know you are seeing something significant. It is stuffed with works from Donatello, Verrocchio, Giambologna, Cellini and Michelangelo. It includes original pieces, stunning bronze statues and a certain aloof quality. My favorite may be the Bacchus by Michelangelo (see Anthony in statue-mimicking pose in front of the Bacchus. I would not have posted this photo of him, BUT no photos were aloud and it was the only one I snapped before getting in trouble). The statue was amazing. Anthony could have posed for him, don't you think? 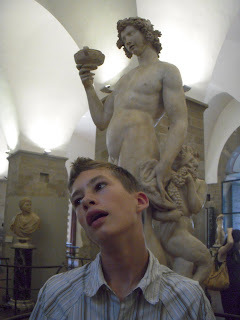 Giambologna made numerous bronze statues of birds [among other things]; check out the photo with Caleb. There was also a room called the 'ivory collection' with the most intricate, infinitesimal detailed ivory boxes, brushes and figures you can imagine, not to mention Donatello's bronze David---and Giambologna's bronze Mercury. Sigh. I need to go back and stare. What is that about? But more on our search for life's importance in posts to come. For now, we will bore you with details of reality, aka our daily life, and life abroad. In short, museums visited, piazzas encountered, gelatos tasted, ingredients uncovered (hey: I found baking soda! ).